What Do Fort Stockton and Junction, TX Have in Common? If you said they are both located right off of I-10 and have very nice RV Parks you’d be right. They are both small towns, (Ft. Stockton, pop. 8,535 and Junction, pop. 2618) but their convenience to the major east/west freeway makes them a popular stopping point for the traveling community. 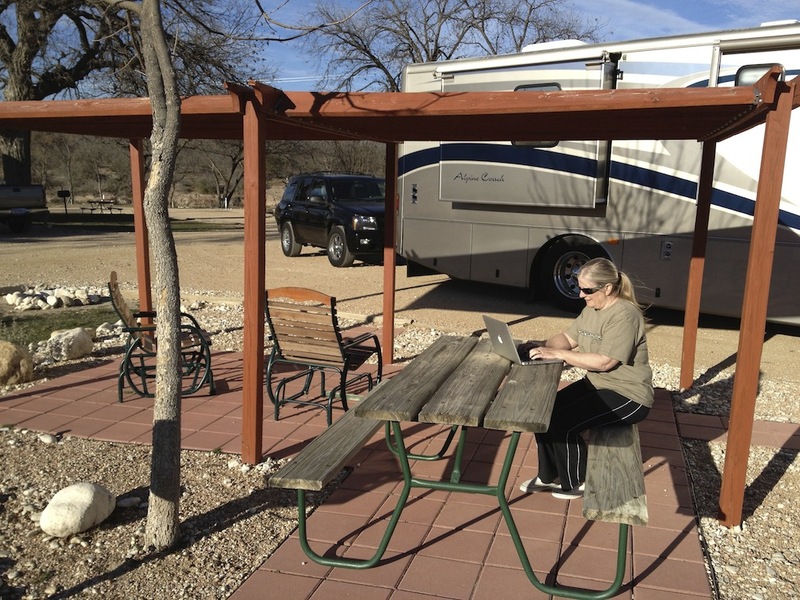 On our second night out, we stayed at Fort Stockton RV Park in Fort Stockton and the next night we were in the Junction North Llano River RV Park. They have very large spots…which was a welcome change…beautiful park-like surroundings, and nice amenities. Even had biscuits and gravy for breakfast in Ft. Stockton…I guess our diet starts later. 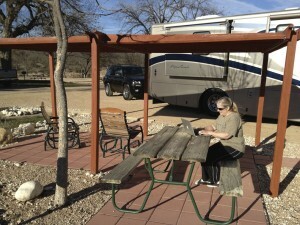 I also enjoyed sitting in the gazebo on our site in Junction while I got some necessary work done. Great atmosphere for creativity! They also have another thing in common and that is wind. A sign at the check in desk said “no the wind is not always this strong…some times it’s worse!” and I believe them. Now we’re parked in Port Aransas, TX. The population here is 3480 and it is the only established town on Mustang Island. According to Wikipedia, “It is located north of Padre Island and is one of the longest barrier islands along the Texas coast. Corpus Christi Bay, the Gulf of Mexico, the Lydia Ann Ship Channel and the Corpus Christi Ship Channel make up the surrounding waters.” We’ve heard it referred to as paradise and we’re really looking forward to some R&R. Moving took a lot out of us physically and emotionally so we’re ready to sit back, relax and enjoy the environment. We’ll be here for a month and then head north again. Stay tuned and we’ll fill you in on our adventures on Mustang Island! If you have some places you think we should visit on our journey, let us know by commenting below. We are certainly open to suggestions! Good day, I just wanted to write u to say that I like ur blogs. I plan on full time rving next year by myself. I’d like to keep connected with ur blogs for more tips and expectations. Thx Best wishes to u. Good luck to you Andrea. Glad you are enjoying the blogs. Keep me posted on your progress. Thank you for all of your tips and insights. Presently living in Maine, too cold heading back to the West to be nearer to my son and daughter. I am researching to become a full timer. I am 60 and a female who will be doing this solo. 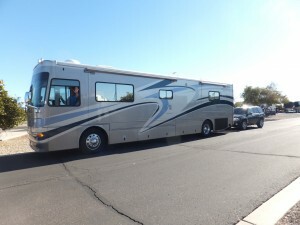 I am studying what type of RV/Rig should I try. I would buy a used one. What do you think of a scamp 5th wheel? What type of vehicle should I try to find to tow it? If I could afford a coach that you drive, would I be able to drive and maneuver it by myself? 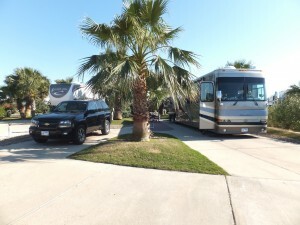 Are you still living full time in your RV? I am 5’2 with a fused cervical disc. (I have my notebook out writing notes on the resources regarding doing this full time. Thanks for commenting on this site. Sounds like you are doing all of the right things getting ready for your big plans to full time. I’ll do my best to answer your questions. I am not an expert on what vehicle you should buy. We’ve only owned a motor coach so I have no experience with fifth wheelers other than a lot of our friends have them. So I’m unable to give you advice on the brand or anything like that. What I will suggest is to talk to people that you know that have fifth wheelers and ask them their opinions. Get on some group forums on Facebook or LinkedIn that discuss these issues. Join some organizations like Good Sam and others and get on their mailing lists for information. Even though you wish to buy a used one, talk to some of the dealers around town and gather their insights. – What do you think you’ll be comfortable driving? Test driving might be the best way to find out. – What kind of RVing are you going to do, travel around the country or spend your time in one or two places a year? – How much room do you feel you need to live comfortably? – What kind of amenities do you want? Washer/dryer, residential refrigerator or electric/propane one, or bare minimum? – What type of layout fits your lifestyle? One bedroom with a sofa? Dining table or booth? What other options are out there? – You mentioned you have cervical disc issues…which vehicle is better fit for any restrictions you may have and physical comfort…whether it’s driving it or staying in it. These are just a few things that come to mind. I would suggest test driving as many types as you can reasonably. That’s one way to find out what works and what doesn’t. As far as driving a coach and maneuvering it by yourself, I’ve seen a lot of single people on the road and they seem to do just fine. There are all different sizes of coaches, so again, your comfort in handling them may dictate the size. I know there are some websites online that were started by single women who full time. Google them and join in the conversation. That’s a great way to learn. I hope this has been helpful and maybe others will chime in and discuss what they know. Good luck and keep me posted on your progress.